One of the complaints made about Pixar (other than the general awfulness of the entire "Cars" world) is that they've never, ever had a female lead. Well, next summer, that's all going to change. 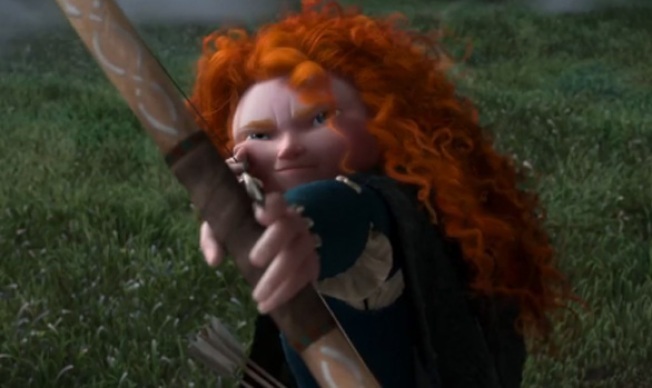 The animation powerhouse has just released their first look at "Brave," a sweeping Scottish epic with a scrappy ginger heroine front and center (voiced by "Boardwalk Empire" star Kelly McDonald, although you don't hear her speak in the teaser). It looks impressive, but that's not really such a surprise considering the source. Is this a kid-friendly "Game of Thrones"? How awesome would that be? We'll be happy if "Brave" gets Pixar back to telling layered, intelligent stories on a grand scale and not, you know, trampling all over the entire moral lesson of "Wall-E" by telling kids that gas-guzzling muscle cars are cool and that Larry the Cable Guy is funny. "Brave" opnes June 22, 2012.